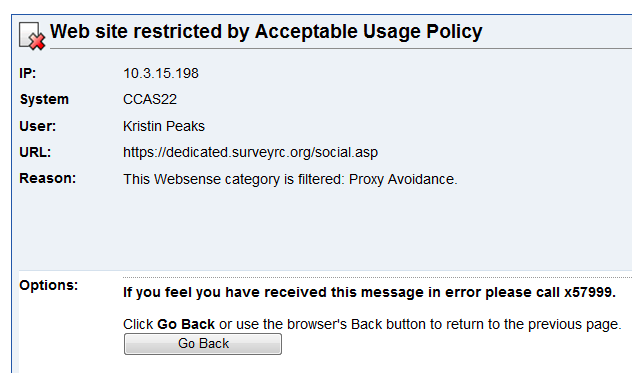 What if you’re blocked from taking the survey on Web site blocking? In October, the Mayo Clinic Center for Social Media launched a survey to assess the extent to which health care workers are blocked from access to social networking sites. The survey also aims to uncover the key reasons given for blocking, so we can address the objections and make the case for openness. It's part of the work of the Employee Access Task Force we have established through the Social Media Health Network. In addition to publishing the survey results, the task force will be preparing a white paper and toolkit for advocates to use in opening access. Imagine our surprise when we found out that, for at least one organization using Websense, our survey about Web site blocking was itself blocked! As Ed Bennett, a member of our Advisory Board and the chair of our Employee Access Task Force, put it, "This is an example of a bad record in the Websense database - a false positive. They had the domain listed as 'Proxy Avoidance' when it's not. There are ways to get it corrected, but it takes time and gets in the way of your work. The same problem can hit any site, and Websense relies on customers to find these errors. In effect we have to do the work for them." Sort of proves our point, doesn't it? Blocking access in the name of preserving productivity, which means that employees wanting to access a legitimate, work-related site need to waste a bunch of time proving they need access. Take the survey if you can. And if you're blocked, please leave a comment below to tell us about your experience. What if you're blocked from taking the survey on Web site blocking? In October, the Mayo Clinic Center for Social Media launched a survey to assess the extent to which health care workers are blocked from access to social networking sites. This is an example of a bad record in the Websense database - a false positive. They had the domain listed as 'Proxy Avoidance' when it's not. There are ways to get it corrected, but it takes time and gets in the way of your work. The same problem can hit any site, and Websense relies on customers to find these errors. In effect we have to do the work for them.